PastaQueen reviews the new Long John Silvers Freshside Grille Menu while attempting not to use pirate talk, me mateys. Arrrgh, she screwed up already. Disclosure: Long John Silver’s sent me $35 worth of “treasure checks” to use to sample their new Freshside Grille menu and write an unbiased review. I used $15 worth of the checks to sample their menu, I’m giving away the other $20 worth. Shiver me timbers, but I had never eaten at a Long John Silver’s before this month. My family had a handful of fast food restaurants we patronized – McDonalds, Arby’s, Hardees, White Castle, and a place in Crawfordville called Rax that I thought went out of business ages ago, but Wikipedia says it’s still operating in some locations. I never stepped a boot inside a Wendy’s or a Burger King until high school when my friends invited me to these places or worked behind the counters there. This is particularly odd considering that LSJ is part of the Yum! food brands whose headquarters is in Louisville, Kentucky where I grew up. I didn’t even know Long John Silver’s was a fast-food style restaurant. I thought it was a sit-down place like Reb Lobster or Joe’s Crab Shack, which are the only other seafood restaurant chains I’m familiar with. However, they sent me some “treasure checks” to sample their new Freshside Grille menu, so I wasn’t going to turn down free shrimp. I could tell when I walked in that they were heavily promoting this new menu option because there was a huge lighted sign on the wall (which I posted above). I looked at the menu and saw that I had the choice of three main courses – Grilled Pacific Salmon, Grilled Tilapia, and Shrimp Scampi. Each meal also came with a vegetable medley (which sadly did not play music for me), seasoned rice, corn with butter oil (strange how it’s butter oil and not butter) and a breadstick. (You can’t go anywhere without getting a breadstick.) I ordered the tilapia meal which looked like this. The cashiers saw me snapping photos of the menu and the food, which probably made me look like a secret shopper. Also known as mystery shoppers, these are people who take on assignments to order certain foods or ask certain questions of employees so companies can check up on their stores. I looked into doing it once, but didn’t think a free meal was worth all the trouble. The cashiers walked by a couple times to clean and get water, but if any of them asked about my camera I was prepared to tell them, “Don’t mind me, I’m just a blogger…Arrrrgh!” Public embarrassment over picture-taking is just a job hazard. I unwrapped the item in the yellow plastic bag to behold, OMG, corn on a stick! This made eating the corn so much fun, almost like it was a corn-flavored ice cream treat instead of a vegetable I would probably see in my poo a day later. Eating food on a stick makes it much more fun. I want to eat all my food on a stick! The meal was tasty and I’d definitely order it again. I entered the restaurant for lunch hungry, and left feeling surprisingly full. Then I looked at the little nutrition card I picked up at the register and figured out why I was so full. The entire meal comes to a total of 765 calories. Damn! I only ate half my rice, so I probably consumed 630 calories, but that can still be pretty hefty if you’re on a 1200 calorie diet (which I’m not because I would DIE, or at least stop menstruating). However, if you trash the breadstick it goes down to 595 calories and if you act like you’re at a wedding and toss the rice, it gets down to 325, a much more acceptable number. If you order this meal, you probably shouldn’t eat everything they give you, but the same can be said of most restaurants. Do the math and figure out what works for you. 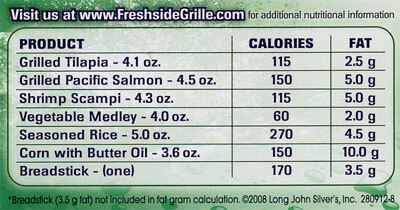 The salmon meal also has an additional 35 calories in the main entrée. They all cost $6.99, which came to $7.62 with the 7% sales tax in Indiana….or no it doesn’t. Huh, I think they should have charged me $7.48, but it’s not my money, so who cares? I don’t know why they charged me 9% tax, unless there’s some secret seafood tax I don’t know about. The only question I have left is why do they spell it “grille” instead of “grill?” When you add the “e” it refers to the grille on a car or metal grilles on your teeth. You’re not going to get any copy editors eating at your restaurant with spelling like that. On the way out of the restaurant there was a bell by the door with a sign that said I should ring it if the meal was good. I enjoyed the meal and fish is a good source of protein and omega-3 fatty acids, but I figured the cashiers were sick of hearing it rung day after day and was rather surprised they hadn’t ripped the ringer out of it already. Now, if you’ve read this far, you can participate in my giveaway! I’ve got four $5.00 treasure checks left to give away. I’m going to give two people $10 worth of checks so they can try the meals. If you want one, comment on this entry by 11:59pm on Saturday, February 14th, 2009 using pirate talk. A winner will be drawn randomly. Get on it, me mateys! Later: Ask a loser: How did that organic diet go? Tis been a while since me last visit to LJS, might want to stop in at the next port….Arghhhh! Aye, your bill walked the plank for there’s an extra tax for restaurants! Arrr, I be wantin t’ have one o’ yer Long John Sil’ver booty. I be hungry after a long tide at sea. I be gett’n the scurvy if it weren’t for ye ol scallywag! Ahoy matey….bring on the grog and free booty! Aye, me would like t’ have a chance t’ try out the new Grille menu. That sounds like fun. Thanks, argh! Aye, shake your money maker. Gar, Where can I find a bottle o’rum? Ahoy, me hearty lassy, Pasta Queen, I ha’e only e’er tried that Scallywag, LJS’s mangey fare the one time, many days gone by. But for a mere taste of the grand and glorious corn on a stick, I’d gladly use your coupons ‘stead o me own doubloons. Argh, PQ, me parrot says to give me a coupon, or walk the plank! My wife loves LJS can’t say we have tried the grilled yet though. (Insert obligatory “Argh here) I be the wench who would like to win the LJS prize booty, so that I may take me scallywag of a husband to dinner, matey! Not interested in the free booty since it would, well, expand my booty. 10g fat in the corn w/butter oil?! No thanks. I just wanted to say thank you for the potty humor (“This made eating the corn so much fun, almost like it was a corn-flavored ice cream treat instead of a vegetable I would probably see in my poo a day later.”) It made me giggle out loud at work. And then my coworkers started eyeing me strangely. argghhh give me the booty! Aye matey… butter oil indeed! Arrrrgh… I don’t generally go into LJS unless there is absolutely no other choice, because the grease level in their food makes me want to toss my cookies overboard. However, ahoy! I like the idea of something not deep-fried, so arrrgh, I’d love to win some coupons. Or whatever they’re called. Ahoy again! rum, parrot, argh, ahoy, booty, matey, plank….is that pirate-y enough? Aaaaaarrrrrrrrrrgggghhh! I’d hobble me peg leg down ye ole plank for LJS coupons! OMG I forgot all about RAX!!! loved their chocolate chip shakes… except the darn chips would clog up the straw… *sigh* good times. I would probably throw away the corn and the breadstick. The fish and veggies looked pretty good, though! I think you may be my sister. I also grew up eating at Rax (they had a great salad bar, IIRC, and they were one of the first fast-food places with baked potatoes), and somewhere in my junk I also have that Chex-themed Rubik’s Cube. Interesting that it includes a breadstick. I would rather have their hushpuppies instead for about the same calories! Shiver me timbers – I’ve been a wantin’ to give these menu items a try – ARRRRGGGGHHH! Yarrr! Ahoy matey! Aye be wanting to try a new LJS “grille” meal! Share the booty or ye sleep with the fishes ye scurvy cur! Oh man, I loved Rax’s blueberry shakes! Probalby a good thing they went out of business in my area! Ahoy matey! I`d sure love t’ win this prize! 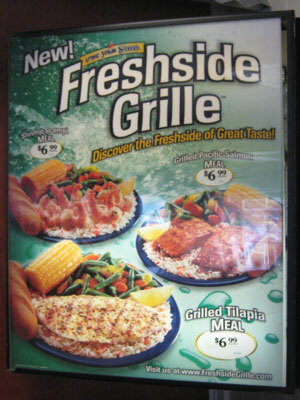 I love booty…errr…an’ I`ve got a Long John`s Sil’er starboard down th’ street I could keel haul t’ in order t’ get me Freshside Grille meal! Arrrr! Drop that booty me way and there’l be no more fuss here. Avast ye, matey! Although I’m just a landlubber, a samplin’ of your treasure checks would be a swashbucklin’ adventure! Shiver me timbers, I need some corn on a stick, matey! Arrrr. Too funny that you picked today to review Long John Silvers, hubby and I were talking about it at lunch. They are opening a new one here in my area and it’s almost finished. I’m really glad to see that they are going to have a semi-healthy meal choice for me. I’m sure my husband won’t be going for grilled anything though lol. Thanks for doing this. I love LJS, it tastes awesome. But I always walk out of there feelling greasy and bloated, so I’ve sadly sworn it off unless I become seriously underweight and have to bloat up to fit in a dress, which don’t imagine ever actually occurring. But why is the rum gone??? aaargh. 1) Whats a pirates fav. letter? 2) What kind of car does a pirate drive? Aye…don’t be a scallywag and ‘ave me walk the plank without the LJS booty! I’d like to partake in your free food giveaway! Arrghhh! Aye, I’ve never been to a Long John Silvers either but it sounds good! I’ll be loving the shrimp, matey! Funny, when I think in Pirate talk, I hear the voice of Mr. Krabs in Spongebob. Aarrrhh! Aarrhh! Be mighty nice to be eating some fish from ye Long John Silvers. Shiver me timbers, food on a stick be tasting good. I would love to give them a try. I drive by the Long John Silver here and see their big window decal about their new healthier meals. But I did not want to waste my own money on the meal in case they turn out bad. So this would be a good opportunity to try it out. I forgot to mention also, that I haven’t eaten at this place in at least 15 years. The last time I ate there, it was so greasy and disgusting, it soured me on them that much, but if they are trying to make some lighter meals, I’d consider trying them out. Arrrgh, me thinks LJS is great, but would want to eat the whole meal, matey! What scurvy dogs they be for including so much! It was hilarious scrolling through the comments to see all the “argh”s and “matey”s. As for the tax thing – Marion County and every county touching it charges and extra 2% tax (=9%) at any sit down meal. One percent of the tax pays off the old RCA Dome and the new 1% tax is going towards the new Lucas Oil Stadium. Shiver me timbers! Times are tough so yer giveaway will get me a grand great adventuaaarrr! Arrrgh, matey, me thinks not many scallywags r’ be ringin’ th’ bell…. Hey did you hear about the latest pirate movie? It’s rated Arrrrrrrrr! I will be trying these out but I wish you could order it just the fish and veggies. Will power is NOT my strong suit!!!! It doesn’t look too bad. Although the “vegatable medley” looks alot more appetizing in the picture, go figure. Chili’s also has corn on a stick, only if you order it with chicken crispers though. Damn you bread battered fried goodness! Happy New Yaaarrrrrr, matey! I love that you’ve eaten at Rax before. When I mention it to people they look at me like I’m crazy. No one I know has ever heard of it! I would love to try the new meals at Long John Silvers! They closed all the LJS around us. Too bad I miss the greasy fish & chicken! Shiver me timbers, argh. That there fish sounds good. Avast ye mateys. Or something like that. Arg, matey (that’s the only pirate talk I know…) I don’t think I have every been to a LJS either. No, seriously. I work at a preschool, and we’re going to have a “Spring Day Camp” with a pirate theme, but they can’t make me talk like a pirate. I’m gonna be in charge of the youngest group. We’ll be the landlubbers if it kills me. I didn’t even know Long John Silvers was still in business. HAHA! Shiver me timbers matey… pick me!..arrrg. LOL!! Ahoy Matey! Free food means more booty for my treasure chest! ARGHHHHHH! Can I talk (err, write) like a Somalian pirate? nothing clever from here, just a yen for free food. Personally, I would chuck a whole meal just for one or two LJS hush puppies. I had the talapia and really liked it as well, I didn’t get the rice and don’t remember there being corn on the cob either, lol!!! I do so love corn on a stick. However, my local LJS has not endeared itself to me as it always takes 15 minutes to get food at the drive through, and I’ve seen employees (while waiting 1/2 hour for shrimp) holding babies and talking on cell phones behind the counter. That being said. I love the food. I just need to find another location to enjoy it. I find that Tilapia tastes moldy…every time I have eaten it. I wonder if I have a genetic thing where I can taste it an no one else can. Funny how restaurants are jumping on the healthy bandwagon! 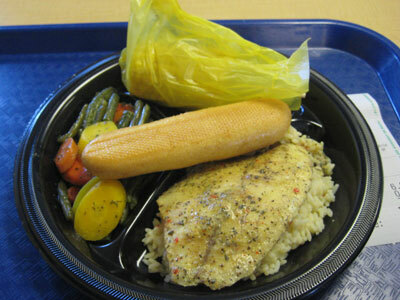 Although, probably in comparison to one of their regular meals, the Grille menu is low, low cal. 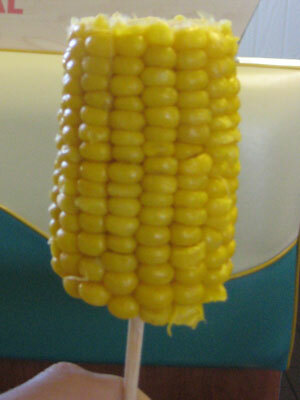 oh – and corn is a grain, not a vegetable, but yes, food is much more fun to eat when it’s on a stick.